Last spring my husband, Richard, and I rented a car to explore Ireland. We anticipated a rolling emerald landscape dotted with thatched cottages and bleating sheep, and to be regaled by the fabled Gaelic wit, “trad” music and spirited pub culture. Certainly we didn’t go for the food, their culinary reputation forecast to be as dour as the certainty of rain. Use a melon baller or spoon to scoop potato from shell. So what a surprise to experience two weeks of blue skies and creative menus and plates inspired by moments-from-the-sea fish, farm-to-table beef, lamb, and cheeses not to mention bounteous vegetables imaginatively prepared. Times have changed on the Emerald Isle and itineraries may be built around savoring the food. In the many menus we perused, however, the items we didn’t see were the ones most expected: corned beef and cabbage. According to Wikipedia, “…In Ireland today, the serving of corned beef is geared toward tourist consumption and most Irish in Ireland do not identify the ingredient as native cuisine.” Richard and I steered clear of the touristy haunts, so perhaps that explains the menu omissions. I used thick slices of lean corned beef, then diced. The following recipe does not so much resemble a recipe imagined from Aunt Fiona’s days in County Claire, as it does a dish with as much St. Patty’s day kitsch as a dancing leprechaun in a field of clover. My roots may be Irish, but I’ve always followed the American tradition of eating corned beef and cabbage washed down with a hefty ale on St. Patty’s day. I make no apologies; corned beef and cabbage, when properly prepared, are scrumptious. 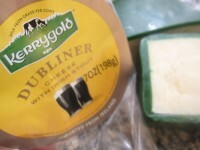 My Dubliner cheese was infused with Irish ale. In the the following recipe, I combined all foods an American might associate with Ireland: potatoes, Irish cheese, corned beef and cabbage. Irish stout was even a part of the dish, as it was added to the cheese, and the chopped spinach and parsley lent the lucky green color. The result? Delicious, the bonus being the stuffed potatoes may be made 24 hours in advance to baking. I make twice-stuffed potatoes often, and in a variety of ways. I included my reduced-fat version in the recipe, as well. 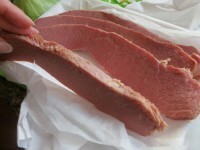 This year I purchased my corned beef, ready made, from The Bread Basket on Carpenter Road, kitty-corner to Lowe’s. I’ve found their Sy Ginsburg corned beef to be as good as what I make in my own kitchen, and I’m happy to have the option of paying a bit extra to purchase the meat lean. If you haven’t tried a reuben from this jewel of a deli, get in your car and drive there. Now. May your dreams come true at the end of a rainbow, a sprinkle of gold dust at your feet. Happy Saint Patrick’s Day! Rub olive oil over potatoes and lightly sprinkle with kosher salt. Place on middle rack of oven and bake 30 minutes. Prick each potato with a fork and continue cooking until potatoes are tender, about 15 additional minutes. 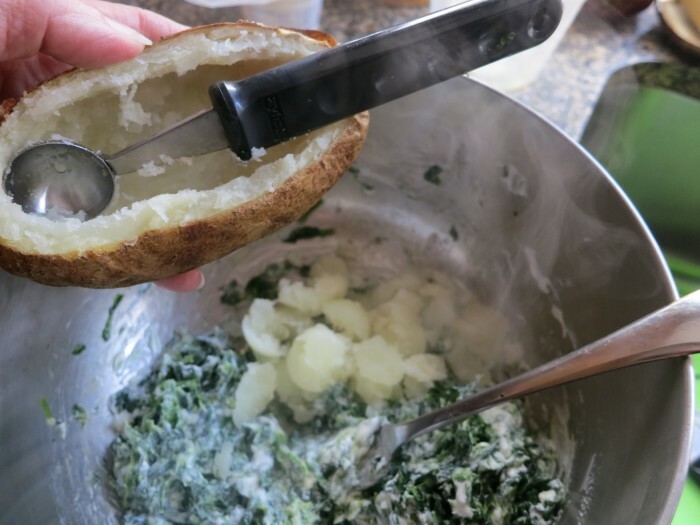 When potatoes are cool enough to handle but still warm, slice 1/4 piece from the top of each potato and, with a melon baller or spoon, scoop flesh into a large bowl, leave about 1/4-inch-thick shell on the potato “bowl.” Place potato shells on a foil-lined baking sheet. Mash potato flesh with 3 tablespoons of the butter (or oil), sour cream (or yogurt), garlic and spinach. Reserve. Bake on middle rack in 400-degree oven until heated through. 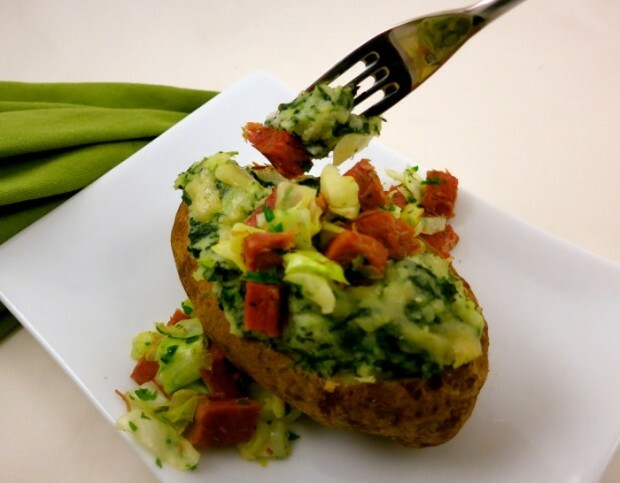 (Time varies according to temperature of the potato prior to cooking; 10-25 minutes.) While potatoes are cooking, heat oil in a sauté pan over medium heat. Cook cabbage with a pinch of salt until tender, about 10-12 minutes. Stir in corned beef and heat. Turn off heat and toss with parsley. To assemble, spoon corned beef-cabbage mixture over hot potatoes and serve. 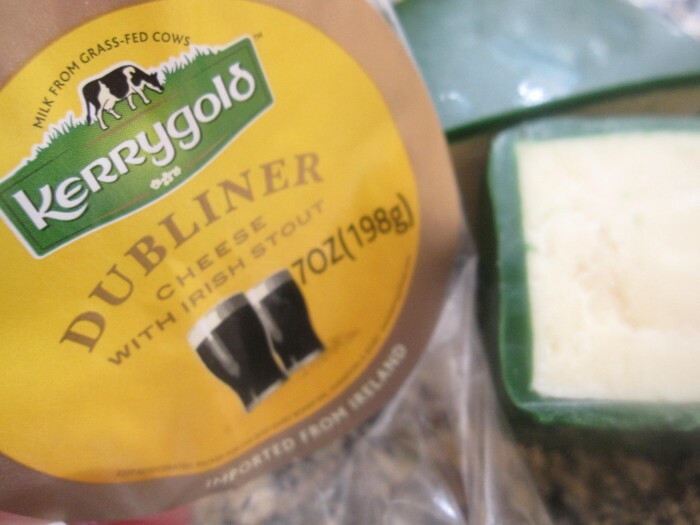 *The cheese I used incorporated Irish stout. My wife and I read your column every week. We appreciate and enjoy your wonderful recipes. In particular, allow me to thank you for your corned beef suggestions last month. The Sy Gunsburg corned beef is, by far, the best we have ever tasted. And, although we have driven by “The Bread Basket” for many years, we never really knew it was there. Thank you, thank you for that discovery!! You write very well and the recipes you select are the best. We wish you continued success and look forward to future columns.